Tonight I will be binding boundoff my Percy Shawl. While I’m excited to see how it blocks, my mind is already moving ahead to the next shawl – the next two shawls actually. Swallowtail is next, then Baltic Blossoms. Yes – nupps galore! The next Swatching Walker post should be up this weekend – Monday at the latest. How long do you take between finishing a big knitting project and casting on the next one? Now I’m not talking about those multiple WIP’s that are always on the needles – like socks or the half-finished and nearly forgotten scarf forget those (or have you already?) – but how long before the next “big” thing that will consume your thoughts, dreams, and knitting time? 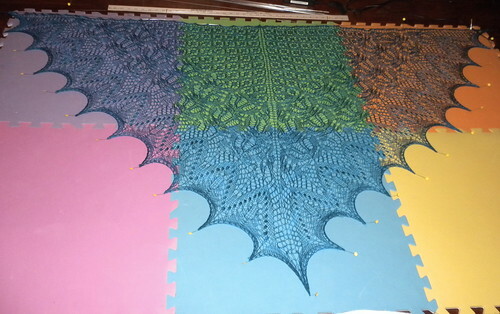 Edited to add a quick photo of the Percy Shawl on the blocking wires. Lost City Knits Tandem Yarn in colorway Avalon.